Simple Java program to find GCD (Greatest common Divisor) or GCF (Greatest Common Factor) or HCF (Highest common factor). The GCD of two numbers is the largest positive integer that divides both the numbers fully i.e. without any remainder. There are multiple methods to find GCD , GDF or HCF of two numbers but Euclid's algorithm is very popular and easy to understand, of course, only if you understand how recursion works. Euclid's algorithm is an efficient way to find GCD of two numbers and it's pretty easy to implement using recursion in Java program. According to Euclid's method GCD of two numbers a, b is equal to GCD(b, a mod b) and GCD(a, 0) = a. The later case is the base case of our Java program to find GCD of two numbers using recursion. You can also calculate greatest common divisor in Java without using recursion but that would not be as easy as the recursive version, but still a good exercise from coding interviews point of view. 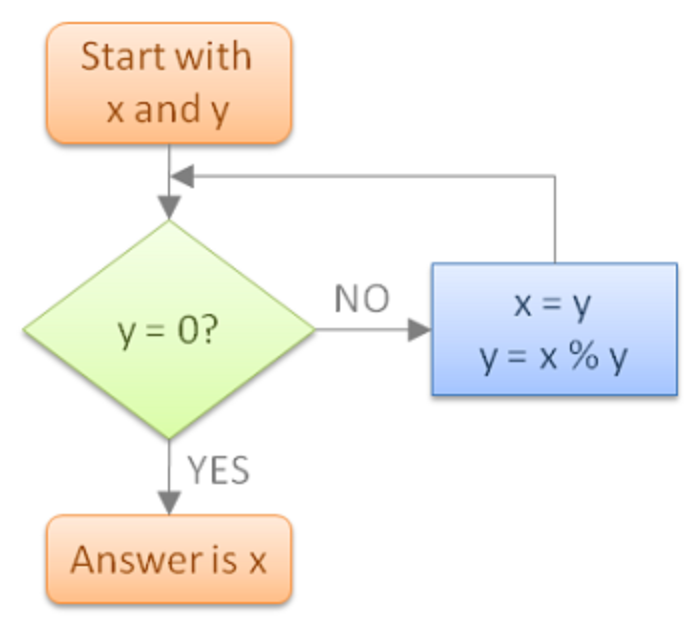 It's very easy to understand this algorithm once you look at the flow chart, which explains how Euclid's GCD algorithm works. 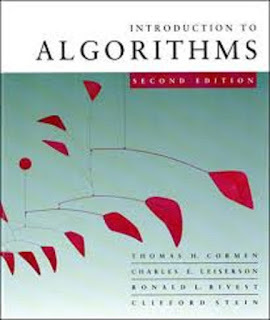 You can also read Introduction to Algorithm by Thomas Cormen to learn more about similar computer algorithms. This is one of the most popular books to learn Data structure and algorithms and widely used as textbooks for algorithms in many school, colleges, and universities. It is also popularly known as CLRS (Cormen, Leiserson, Rivest, Stein). In Euclid's algorithm, we start with two numbers X and Y. If Y is zero then greatest common divisor of both will be X, but if Y is not zero then we assign the Y to X and Y becomes X%Y. Once again we check if Y is zero, if yes then we have our greatest common divisor or GCD otherwise we keep continue like this until Y becomes zero. Since we are using modulo operator, the number is getting smaller and smaller at each iteration, so the X%Y will eventually become zero. Let' take an example of calculating GCD of 54 and 24 using Euclid's algorithm. Here X = 54 and Y = 24, since Y is not zero we move to the logical part and assign X = Y, which means X becomes 24 and Y becomes 54%24 i.e 6. Since Y is still not zero, we again apply the logic. This times X will become 6 and Y will become 24%6 i.e. Y=0. Bingo, Y is now zero which means we have our answer and it's nothing but the value of X which is 6 (six). The algorithm will become clearer when you see the flow chart of calculating GCD of two numbers using recursion as shown below. You can see we are starting with two numbers X and Y and if Y=0 then we got our answer, otherwise, we apply logic and check again. Now let's learn how to convert Euclid's algorithm to find GCD into Java code. Here is my complete code example of how to find GCD of two numbers in Java. This Java program uses Euclid's method to find GCD of two numbers. Thy must be an integer, so make sure you check the numbers entered by user e.g. floating point numbers are not allowed. Similarly, any alphabets and other characters are not allowed except '+' and '-' sign and all these rules are ensured by Scanner.nextInt() call. This method will throw an error if the user will enter an invalid value instead of an integer. //Enter two number whose GCD needs to be calculated. System.out.println("GCD of two numbers " + number1 +" and "
That’s all on how to find GCD of two numbers in Java. You can use this Java program to prepare for viva or other computer homework and assignment test or for your self-practice to improve programming in Java. BTW, there are a couple of other technique to find Greatest common divisor in Java, as an exercise you can explore those methods and write code for that. The key point is you need to learn how to convert an algorithm into code to become a programmer. What is the other way of calculating GCD in Java program, apart from Euclid's method, a comparison would be nice. i built a program w/c is suppose to calculate GCD and LCD but i dont know where to insert its formula?? 1.void take(int a,int b)-to take the value of a and b. 2.void calculate-calculate GCD and LCM. The flowchart is wrong. After x=y then x%y = 0 always. Your program is simultaneously resetting x and y with the same original x and y for each reset. This code is super cool!! Can anyone do this with array of integers that the user can give inputs at the console?